The operation is extremely simple. Because there are only two buttons, you can hardly do anything wrong. It is worthwhile to take a look at the quickstart guide for the settings mode. The display is illuminated and has 3 lines. This means that the result does not have to be transmitted after each measurement, but several measurement results can be copied. If you use the Leica DISTO Sketch app, you do not have to transfer results manually. This eliminates a potential source of error. If the acoustic signal is dispensed with during the measurement, the useful life of the batteries is extended accordingly. You can also measure using the tracking function.If you keep your eyes on the display during a measurement, you can determine the minimum or maximum distance. In addition, the “beep” sound can be set to confirm the measurement process, as well as you can deactivate the Bluetooth interface. The Bluetooth interface and the app Leica DISTO ™ Sketch can be used with the Disto D1 for all complex measurement tasks. The technology for Disto devices is called “Bluetooth Smart” or Bluetooth® Low Energy. 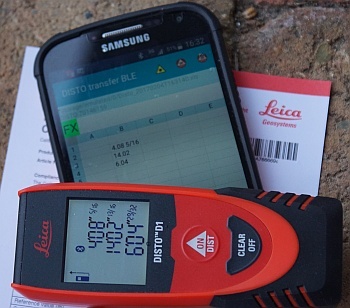 The D1 from Leica is compatible with devices using Bluetooth 4.0. So iPhone 5, iPhone 4S, iPad mini, iPad 3, iPad 4, iPod touch (in the 5th generation), as well as smartphones and tablets with Android 4.3 or newer Android versions and tablets with Windows 8 or newer operating systems. The app Leica DISTO ™ Sketch, which can be downloaded free of charge, works on all of these devices. This app can be used to create floor plans or plans including the walls of rooms. The measured distances can also be shown directly in photos. This results in a photodocumentation, including the measurements, thatdoes not need big efforts. All lengths are transferred via Bluetooth® Smart. This documentation can be saved as a PDF (see our simple test example) and as image files. Still at the building site you can send them from your smartphone via e-mail to the office or to the production plant. You can also create sketches and place distances on them. With the help of a grid, plans can be prepared very easily. Measurements are transmitted by Bluetooth and then drawn to a line in the sketch or the photo. 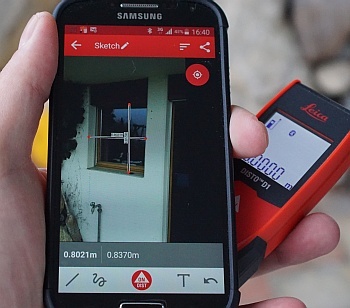 Leica offers another app: Disto transfer BLE. Surprisingly, the box and the included documents do not refer to this app, but it worked perfectly in our test. Excel files (xls) can be opened and you can automatically write the transferred measurements to the active cell. The accuracy is ± 2.0 mm. A calibration certificate is included with the Disto D1, which indicates the accuracy achieved in the calibration process for each device. Our laser distance measurer managed three measurements at lengths of 0.5m, 2.0m and 5.0m with deviations of -0.2mm, -0.1mm and 0.3mm. The measuring accuracy of the D1 is certified according to ISO 16331-1. The Disto D1 is handy and fits into a trouser pocket, so you do not really miss the nylon holster. The Disto D1 is protected against splashing water and dust stated as IP 54. The black parts on the sides and on a part of the housing edges wear black softgrip. The distance meter will fit well in your hand. The Leica Disto D1 offers just the minimum of function. But together with the ISO standard 16331-1 and especially with the app “DISTO ™ Sketch”, it brings together functionalities that are more useful than an integrated Pythagoras. You can buy the D1 online with discount. The Leica Disto D1 is an entry-level laser distance meter. 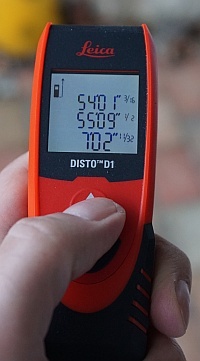 This distance measurer with its connection to both apps brings a lot of useful functionality. With only two buttons, the operation is very easy.The Disto D1 is a powerful tool to create plans and sketches using the Leica Disto Sketch app. Together with this app, the D1 is ideally suited for many occupations that require precise sketches and dimensions. The following video is one of our favorites. Finally, it ia funny and it shows that working with the Disto D1 and the Disto sketch app is child’s play.